It seems to be a while since I did a fashiony sort of post, but after reading the post on Colette Patterns about sewing and wearing black outfits, I started thinking about the black garments I’ve made over the years. Strangely though, I found only one photo where I really am wearing all black. I made this very body-con dress about five years ago (time flies!) out of a pattern that I adapted from a jacket pattern that my ex made for me (I’ll have to do a separate post about the different jackets I’ve made from this pattern later.. remind me if I forget!). 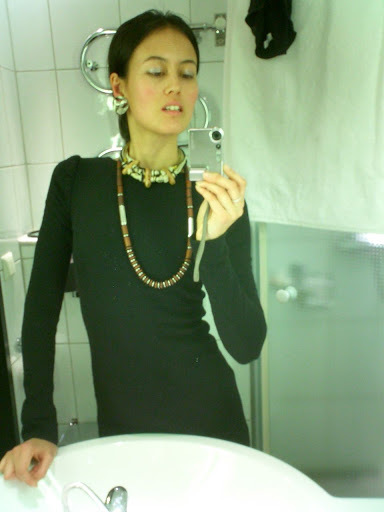 In this pic I’m in my hotel room at fashion week in Stockholm, having just come back after a whirlwind op shopping tour (the necklaces are the spoils of victory). It’s bizarre that I have so few photos where I’m wearing only black, because I am from MELBOURNE which is like the black-outfit capital of Australia and I do have many black things in my wardrobe. But I think it might be because I usually try to avoid dressing all in black as I think of it as a bit of a cop-out and I don’t want to look like a typic al Melburnian. As you can see, even when I am wearing black (well, actually navy, but you can’t tell) I like to jazz it up a bit… this was taken in a beautiful convent in Moscow where I went for fashion week in 2005, and was lucky enough to have a driver and interpreter at my disposal AND hang out with the indisputable queen of black, Diane Pernet (Tavi’s post the other day reminded me that I had this pic and it fitted well with this post). It was somewhat surreal to be walking through a convent in the middle of winter and then come across Diane who happened to be there too… looking like a very stylish noir-loving nun!! You look like Coco herself dear but I think might have already told you that. awww… thank you lovely…CC, thanks for dropping in… and I will check out your blog again soon!